Rotherham-based retailer, Fishing Republic is seeing the benefit to its business from floating on the stock exchange - with turnover up 21%. The IPO in June 2015 raised £1.5m for the Eastwood company that is already one of the largest retailers of fishing tackle in the UK by floorspace. 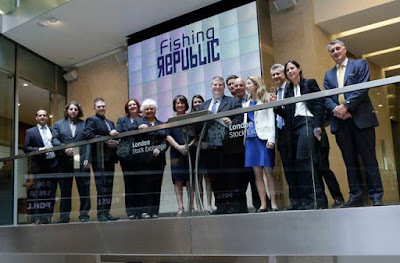 Floating on AIM, the directors believe that Fishing Republic is the only participant in the market looking to act as a consolidator and snapping up smaller, often family-owned fishing retail businesses. In an update on trading for its financial year ended December 31 2015 ahead of its maiden preliminary results which are expected to be announced in mid-April, the group reported that turnover for the year was approximately 21% ahead of the same period last year at £4.1m (2014: £3.4m), in line with market expectations. It said that the increase reflects the benefit of the deployment of IPO funds raised in June, which were used to improve stock levels and enhance the company's marketing activities, especially though its own websites. Fishing Republic also reported that its larger new store in Hull is now open and that its new stores in South Birmingham and Crewe remain on schedule for opening in March 2016. All three stores conform to the company's "destination store" model and offer an extensive range of products for all types of anglers. The group has the benefit of "first-mover advantage" and in December, acquired the business and assets of FishXL Limited, trading as Cotswold Angling. Steve Gross, chief executive of Fishing Republic, said: "We are very pleased with the company's performance since joining AIM in June. The material uplift in sales directly reflects the benefit of deploying IPO funds in the second half of the year and we are now progressing our store expansion plans. "Our new larger site at Hull is now open and the new stores in Birmingham and Crewe are also on track to open in time for the start of the fishing season. "The acquisition of Cotswold Angling, completed in December, provides us with a presence in the South of England and its integration is progressing well. "We remain confident about prospects for the business in 2016 as we continue our expansion plans."